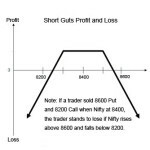 In the USA (United States of America) the short call ladder trade is popularly called as Call Backspread Trade. After my article on the short call ladder, I got an email from one of my regular website visitors, Mr. Michael from the US. We exchanged some questions and answers on this trade. Call Backspread, I assume has a lot of interest to new option traders looking to make unlimited income by paying the least amount of money. We will soon know this is not the case. Since the discussion was detailed and advanced I have kept this in a different article. This may be of interest to people looking for more information on the Call Backspread trade or the short call ladder. If you are one of those traders who buy more OTM options and sell less number of near the money options to reduce cost as a single trade, knowingly or unknowingly you are trading the backspread. This discussion maybe of interest to you. 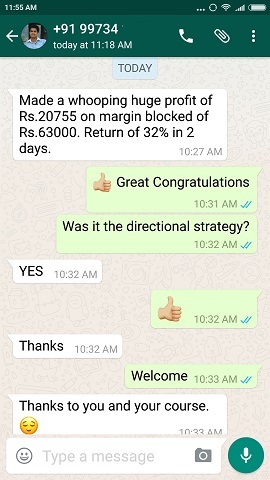 New traders who lost money buying naked options, think Call Backspread is a God send trade, a boon for cheap option buyers. They of course get disappointed. Please note that the Call Backspread behaves the same way and produces similar results as the Put Backspread or the Short Put Ladder (if you are bearish). Needless to say please draw your own conclusion when you trade the Put Backspread or the Short Put Ladder. 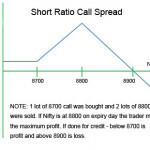 What is a Call Backspread Trade? 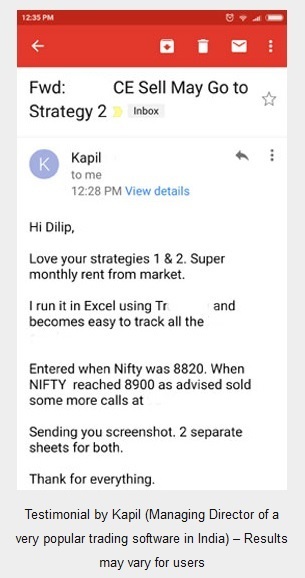 In a Call Backspread trade the trader has a bullish view in the stock, but he/she is not willing to risk too much money by just buying costly ATM naked call options which may produce stellar returns if the view is correct. However if wrong, the trader knows he has a lot to lose. In fact the option may expire worthless, and all his money can be lost. To reduce this risk he sells some in the money (ITM) calls and buys more number of ATM (at the money) or OTM (out of the money) call options. Essentially the trader feels that he will take the ride for free if the stock actually rises. In reality that is not the case. Most common trade is to sell 1 Call option and buy 2. Which means the trader sells 1 ITM option and buys 2 ATM/OTM options. This trade can result in a debit or a credit. If the options bought are further out of the money – the trade can be done on a credit. But DO NOT think that if there is a credit the trader cannot lose money. There is always a trade off in these trades. In this discussion a lot of your doubts on Call Backspread will be cleared. I just read through your E-book of the breakdown and discussion of the different options strategies. A fantastic and thorough explanation of the various option strategies. I wanted to please ask you for your insight into trading Call and Put option “Backspreads” as these seem to be very directional type of strategy. 1. You have the same flexibility in selecting strikes that fit your profit to risk threshold, but you get the added benefit with the Backspread over the Vertical, because your upside isn’t capped and you therefore have “unlimited profit potential”. 2. You can even make a credit, if the Backspread is initiated for one, if the trade goes below the sold Call for example, if doing a Bullish Backspread trade (it basically then becomes a Bear Call trade at that point). 3. You have the option of altering your ratio of bought to sold, depending on just how strongly you feel that the trade will make a big move. 4. On the high dollar priced, as well as volatile stocks like GOOG (Google Inc.), CMG (Chipotle Mexican Grill, Inc.), PCLN (Priceline Group Inc.), ICPT (Intercept Pharmaceuticals Inc.), BIIB (Biogen Idec Inc.), SPY (SPDR S&P 500 ETF Trust) – buying the outright calls and puts on these can be quite expensive, especially if buying 60 – 90 days out till expiration. So by using a Backspread, we are in a sense doing a Vertical spread, of which we can play these higher dollar / more Volatile stocks at a discount. 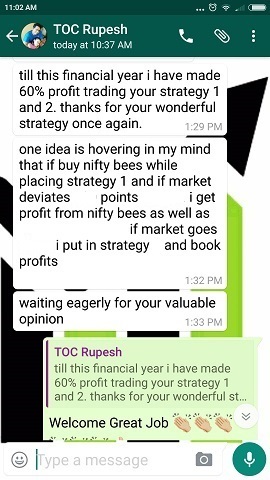 I know that you are very knowledgeable about the strategies (Backspread) so just wanted to get your opinion on trading them, and if you had any thing specific, that I need to understand before implementing this strategy. Thanks so much for your time and sharing your knowledge. P.S: How much and how would I go about purchasing your course please, as I live in the USA? >> 1. You have the same flexibility in selecting strikes that fit your profit to risk threshold, but you get the added benefit with the Backspread over the Vertical, because your upside isn’t capped and you therefore have “unlimited profit potential”. a) Leave till expiry. Not good choice for any option trade in the world. A profitable position may get into loss. b) Set a target. Good but difficult as volatility will be a big player. Plus when the stock is moving up you will get greedy for more. Remember the money is there to take and its unlimited. You may want to ride this as much as possible only to see you got less than you wanted. You will NEVER be satisfied with whatever you make especially if the stock finishes up further on the expiry day. Still setting a target is a good idea. Buy you should exit once its reached and not look back at the trade. c) As soon as ATM/OTM bought options becomes ITM. (Not sure if at that time the trade is profitable.) This will be tricky as at that time the trade may be in profit or loss. So even this choice is not good. That leaves us with (b) – set a target and exit. But this target has to be with losses as well. 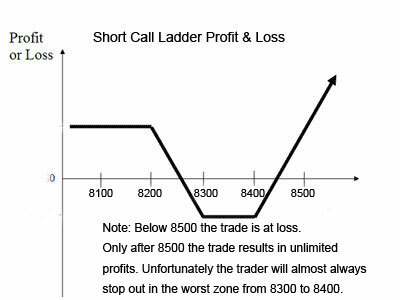 If you read my article on short call ladder you will see that maximum loss is unbearable. You have to make sure it does not happen. So you have no option but to set a target. Now tell me what is the difference between this trade and buying less number of naked ATM call options? You can always set a target even when you buy an option and exit for a set profit or a loss. Agreed if the stock falls below the shorted option and if the Call Backspread was done for a credit the trader may make a small profit. But to create such a trade you will have to buy options far out of the money. For option buyers this is not recommended because realizing a good profit when the stock rallies will get difficult. You may therefore most of the times trade this with a debit. So you lose money even if the stock falls. Moreover the stock will not fall every time you trade. Therefore to me this is not a better trade than a simple Call Debit Spread. If my view is bullish, I would rather trade a Debit Spread than a Call Backspread for the simple reason that risk in a debit spread is far better than a Call Backspread. Reward may be better in a backspread trade, but for me risk is more important than reward. Call Backspread only looks better on paper – in reality it is not. So would always entering a Backspread trade, be best by entering with 1 sold ITM and buying 3 – 4 OTM, for the sole purpose of being able to take profits once certain targets are hit, and still having the trade covered via having more bought Calls then sold Calls? I know that by doing so, that we likely wouldn’t receive a credit for putting on the trade (and may be even a small Debit), but by using a 3-4 bought for 1 sold, we give ourselves the opportunity to lock in and take profits, if and when the trade exceeds the upper Breakeven? As long as you are getting a credit – or trading with a small debit – this is OK. But remember doing this with great strike prices may be difficult. You may have to go deep ITM sell and deep OTM buy – not good. Also you need to calculate max loss – this is the place where the stock expires where all the options bought expires worthless and you also need to pay money to cover the short. This situation will be worse than buying naked call options. This means even if you have a credit, it does not mean you cannot lose money. This is true but you may have to buy deep OTM calls. In that case even if the stock moves in correct direction your target may get difficult to achieve. Great point, and I guess this also gets back to the last question, to be able to buy at a higher ratio of long calls to short ( 3 – 4 : 1 ), we’d likely have to buy further OTM or sell deeper ITM, to cover the extra 1 to 2 Long calls. Would it then come down to, whether or not we are fine with NOT receiving a credit for initiating the Trade? The problem with such a trade is that the stock has to move significantly for the deep OTM calls to make meaningful gains. Remember that the delta of the short is more than the delta of longs. So one the one hand your short will be loosing money fast, one the other the bought Calls will make money slowly. However try to trade the best options possible and make sure you are NOT paying a lot of cash to trade this. Small debit is OK.
>>It seems that, we would put on a BackSpread trade, if we had a strong conviction, that the stock was going to make a BIG move. So my thinking is, would it make sense then, to put on more Long calls and thus give up receiving a credit, to allow ourselves the opportunity to have on the extra 1 or 2 long calls, to lock in profits along the way, if/as the trade makes that BIG move we were expecting? Yes true – but how many times will this happen? Do you think every time you expect a big move – the stock will actually move that big? If not your cash will be lost. Over time this will neutralize the results. Sometimes great – sometimes not so great. Consistency will be lacking. >> 3. You have the option of altering your Ratio of bought to sold, depending on just how strongly you feel that the trade will make a Big move. Yes true – keep changing your view and keep losing money when you were too bullish. And make less when you were less bullish. 🙂 Markets won’t behave the way you want them too. >> 4. On the high dollar priced, as well as volatile stocks like GOOG, CMG, PCLN, ICPT, BIIB, SPY buying the outright calls and puts on these can be quite expensive, especially if buying 60 – 90 days out till expiration. So by using a Backspread, we are in a sense doing a Vertical spread, of which we can play these higher dollar or more Volatile stocks at a discount. Options are priced in such a way that doing Backspread for 60-90 days options will surely cost you money. Its not easy to go that far, get great strike prices, and still get a credit. >>So the BackSpread then works like buying a regular Long and Put works. The more time to Expiration, the more expensive the Options. >> How many days to Expiration then, do you usually look to go out, as to allow yourself enough time for the trade to make the move you are expecting – 30, 45, 60, 75, 90 days? See in this trade you are mostly long calls. Going very far or short in number of days is NOT important. Your view on the stock and Max loss that you may face is. Please calculate your max loss when trading this. 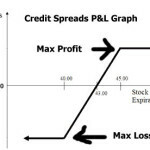 Agreed if you stop out earlier, you will not lose the max loss – but its an important number to know before you trade. This is the reason why you shouldn’t pay a lot to trade this. Small debit is OK. That way if the stock falls, you don’t lose much. >> And does the time to Expiration come into play, depending on what time frame chart you are basing the trade itself on? For instance, on a 1 Day chart, may be buy 30 – 45 days till Exp. On a Weekly chart, go with around 60 days till Exp. On a Monthly chart, 75 – 90 days? As I said – plan before you trade. See if your Max loss (unfortunately profit cannot be calculated) justifies the trade. If there is a Max loss you are NOT comfortable with – either you should not trade or you should have a stop loss in your system. 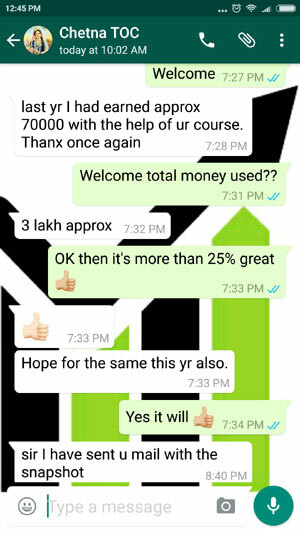 For profit taking too – you should know how much profit you want from the trade. Unlimited is only on paper, until you take it. I think in US you can have a stop loss in system which is called Good ‘Til Canceled (GTC). This feature is not here in India. Make best use of GTC. Or monitor your trades closely to take profit/loss out at a predetermined value. Remember this – you basically want to make unlimited profits, by paying the least. The idea is right, the implementation difficult. My only problem is unlimited profits is on paper. When the stock moves in your direction depending on how many options you bought and sold you may be making less because of the losses in the sold option, and you may want to wait. Usually this will bring good profits when expiry is near. You may want to wait for expiry and then the stock reverses. 🙂 In panic you may stop out earlier. You cannot time this as the way you think you can. Michael, Many Thanks for asking some genuine questions on Call Backspread. This will help a lot of traders. And nice to know you are reading. Thank You. If you are a beginner I will send you more links for free to learn the basics of options. You can read that and then read my course for better understanding. Of course support will not be given on the basic course as you do not pay for it. But its easy to understand. 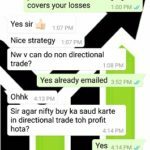 You should start with non-directional – its an easy trade and mostly generates profits. Later once you become slightly experienced, you can move to rest of the strategies. Please inform me when you pay by email.